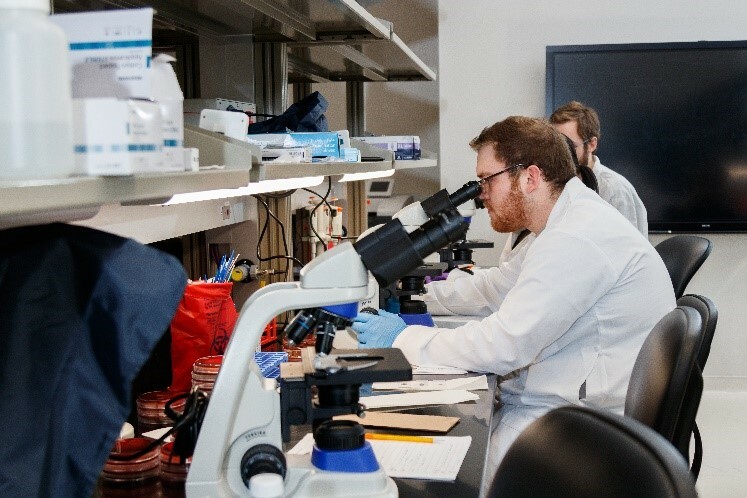 First degree students and returning students seeking entry into the Clinical Laboratory Science (CLS) program will do so through the Traditional Track. Students are encouraged to enroll at IU South Bend under the pre-CLS degree designation. Students will meet with advising to determine required pre-requisite courses and develop a plan for course completion. Upon completion of all pre-requisite courses, either through IU South Bend or as part of a previously attained degree, students may apply for acceptance into the professional phase of the CLS program. At this time, typically during the second (sophomore) or third (junior) academic year, students will officially apply to be accepted in the clinical track. Successful applicants will be recoded into the Clinical Laboratory Science BS (CLSBS) program and follow a 3 semester cohort model to degree completion. After completion of didactic and laboratory courses at Riverside Hall (see IU South Bend CLS BS campus bulletin page for details), students will complete a 16-week clinical rotation at a local affiliated clinical laboratory. During this time, students will rotate through all areas of a clinical laboratory and gain additional experience under the supervision of a practicing laboratory professional. During the last portion of the curriculum, students will take advanced courses in chemistry, hematology, immunology, and microbiology. Upon completion of the Bachelor of Science in Clinical Laboratory Science, students will be eligible to take the national registry exam for Medical Laboratory Scientists (MLS) through the American Society for Clinical Pathology Board of Certification (ASCP-BOC). Nationally certified MLS are able to seek employment at a variety of local, regional, state, and national clinical diagnostic laboratories. Programs and curriculum are subject to change. Please refer to the academic bulletin for current information regarding pre-requisite and program courses. The Advising Center in the Dwyer College of Health Sciences is also available to answer questions about the program and assist with application completion. They are located on the fourth floor in Northside Hall and can be reached at (574) 520-4540. Applications are available in both the fall and spring semesters for acceptance for the next spring cohort.